However, it's been well over a year since that article so I thought it a good time to revisit this concept. 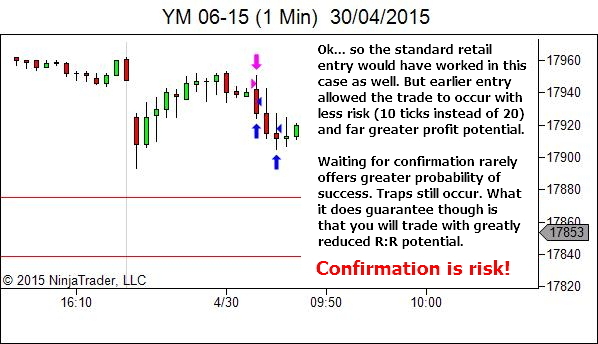 The S/R structure and trend analysis of the YTC Price Action Trader methodology provides the context within which we trade. 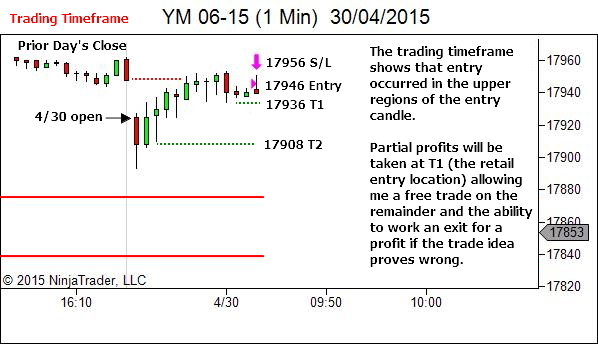 Our projection of the trend forward provides the locations for trades. Our strength and weakness analysis and bar by bar analysis supports our trade decision as price moves into the trade zone. 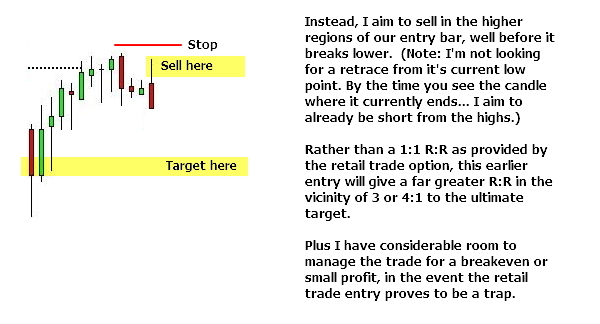 And if using the standard methodology then our lower timeframe trigger patterns allow us to enter while still in the wholesale part of that trade area. 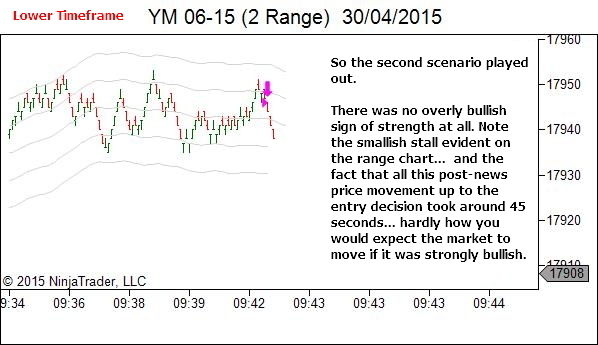 However, what I love about the YTC Scalper approach to lower timeframe trade entry, is that when applied within the context of the above S/R and trend framework and trade setup analysis, it allows us to get in REALLY close to the edges of the market structure. But I also DO NOT wait for confirmation. My preferred method of entry is to watch the lower timeframe and wait for the opposite side of the market to exhaust itself. If I'm looking to sell, I want to see that the buyers have given it everything they've got… and they've run out of steam. I'm selling, not because price is moving lower, but because it can't move higher. If I'm looking to buy, I want to see that the sellers have given it everything they've got… and they've run out of steam. I'm buying, not because price is moving higher, but because it can't move lower. So let's look at the trade. 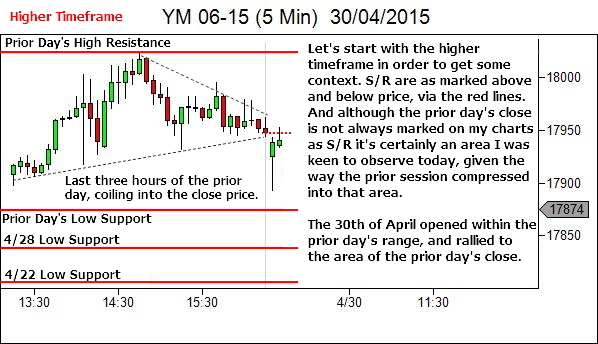 The first half hour of this session provided exceptional trading conditions. 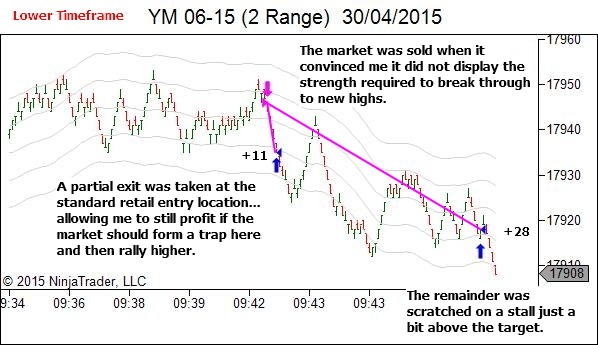 From here the market went on to provide a number of very similar opportunities, with entry taken short at VERY WHOLESALE price locations. No confirmation required at all. could not agree more with early entry article. I agree. 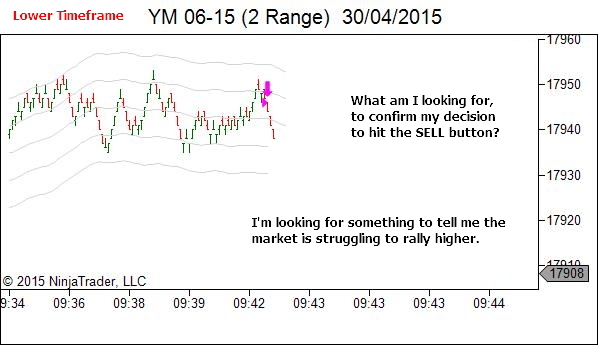 Hate nothing more than being fooled by false breakouts at the worst possible trade location. 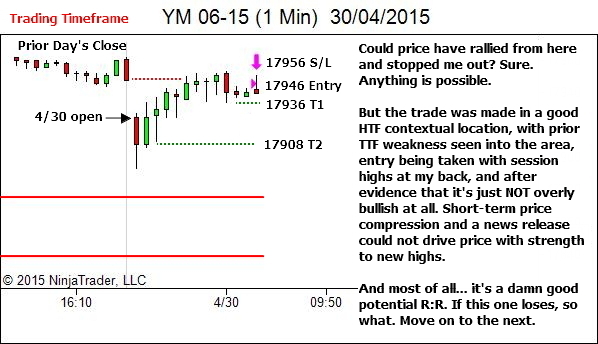 I was looking at prior day Hi/Lo but not at it’s close. It’s potential S/R, depending upon context. Look at the prior day’s chart. If the close looks relevant, mark it up. Otherwise don’t. S/R doesn’t need to be any more complex than that.